Sometimes, I feel like a fraud. 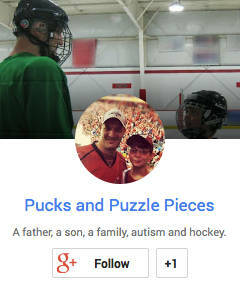 Sometimes, I feel like a fraud for writing about Ryan’s struggles with autism, because he is mildly affected and I know our lives have little in common with those who parent children who may be non-verbal, self-injurious, and unable to care for themselves. Other times, I feel like a fraud for writing about our triumphs and happy times, because those glimpses of happiness often occur as blips on a radar screen full of turbulence. My last post was titled “This Is What Happiness Looks Like.” It was about being together as a family at the Devils game Friday night as they clinched the Eastern Conference Finals in overtime. I had taken a snapshot of both kids celebrating that was the inspiration for the title. The title of the post was accurate. We had an amazing time, and we created memories that will be will all of us for a lifetime. Here’s what I didn’t mention — that before we even got home, there were problems in the car. Ryan snapped at Riley over something she said. Or maybe it was the song on the radio. I’m not really sure. Whatever it was doesn’t matter. It was just a quick reminder that whatever happiness we took away from that event did not carry over for Ryan. And that is because navigating his way through each day, through each mystifying social cue, through each sensory experience, through each mis-ordered moment of this world that refuses to line up in the precise patterns his brain prefers, continues to be a very difficult challenge for him. I returned home from work yesterday to be greeted at the door by a hug and a kiss from Veronica. I could tell by the look on her face that all was not well behind the door. I have come to recognize the expression on her face. Ryan was having all manner of difficulties disengaging from whatever activities he was doing — playing NHL2K on the Wii, typing imaginary hockey standings on his computer. Worse, he was not able to enjoy himself while he was doing these things, giving in to the compulsions that demanded everything happen in a certain order. After a series of explosions, we finally got him calmed down before bed. We talked to him about why we had intervened and forced him to turn off the computer and the Wii. We tried to get him to explain why doing these favored activities was making him so upset. The answers did not surprise us, but they saddened us nonetheless. He turned off the computer, then restarted it, then turned it off again because he had forgotten to push the caps lock key. He usually types in all capitals, and I guess he wanted the little light on the caps lock key to be on as he shut down the computer. When it wasn’t, he had to go through the routine all over again. We asked about the Wii games, which he kept restarting for no apparent reason. He told us “I don’t want to tell you the reason because it’s a really bad one.” We assured him that no matter what he told us, we would not be upset. He finally admitted that he started entire hockey games over because he had messed up the records of the teams in his head. See, Ryan can never just play a game of NHL2K on the Wii. He can never just play a game of street hockey in the backyard. Every game is part of some imaginary season, part of a never-ending list of imaginary standings that he silently compiles in his head. When something goes wrong with the numbers, he gets angry, and forces himself to start over. I felt so bad for him. This, I don’t know how to fix. This, I have no strategy for. Part of the reason we have sought extra help for him in the past year, in the forms of doctors and therapists and even meds, was because we saw him as unhappy so much of the time. More and more, I think that unhappiness stems from him being unable to order the world the way he needs to. If the numbers don’t fit, if the lines aren’t straight, if the standings don’t add up, he cannot handle it. Tonight is Game 1 of the Stanley Cup Final, Kings at Devils. I will once again hope for a three-hour block of family happiness, even though we won’t all be together tonight (I have work duties at the game that won’t allow me to be a fan). Even if everything falls apart on the car ride home, I still need to have these experiences. They recharge my batteries, top off my patience meter, and give me the hope I need to take with me into the next confrontation with autism, which is right around the corner. You’ll just have to forgive me if I write about the happiness — even if it makes me feel like a fraud. That’s just the nature of autism. Everyone has different struggles. It doesn’t make you a fraud for telling the truth about your family. I hardly recognize my son at all in the things that I read in other peoples blogs, even though all our kids have been given the same diagnosis. I wish for you WAY more happy times than not so happy ones and GO DEVILS!!!!!! It doesn’t make you a fraud, it makes you a dad who chooses to relish the happy moments. I read this and didn’t see struggles, yes there are, I saw a brilliant kid with an amazing imagination. Wow!! This is a tough rollercoaster ride. Focusing on the positives helps get us through the challenges. And NHL2K… somedays I wish I could hide it, but we all know how that would end. My son too has mild autism, and ur not a fraud. All these kiddos have different “challenges” as my son calls them. My son is a bit obsessive over many things too, and quite the perfectionist. Its hard to watch a child struggle with such thing, and to know, there are times when I can’t help him. Sometimes thats the worst feeling. I wish more happy times for u and ur family! I feel like the old “Facts of Life” song is so very true of parenting, and especially parenting a kiddo with some special needs. “You take the good, you take the bad, you take them both and then you have the facts of life”. Please don’t feel like a fraud. Our kids, like us, have great moments…and some not-so-great ones…it’s all part of life. I enjoy reading about the great moments…keep ’em coming. Relaying the rough stuff is all a part of it, too. No question what we are doing – raising kids on the spectrum – is hard. It’s so difficult to unravel the feelings we have to see our kids struggle, fight, stress and strain against the expectations we can’t help but put out there for them. Your post was honest and raw. It’s was real. Thanks! I don’t put too much autistic stuff on my blog, so I don’t feel like a fraud when I do. I may be mildly autistic, but it’s enough to make me different and quirky.